From one time to another, we have heard of someone getting athlete’s foot, or perhaps you have had it yourself. But did you know you can also get athlete’s foot on hands? This fungal infection that appears as a crusty or scaly, red, circular rash can actually present itself on your hands. Usually, it is caught by walking barefoot in locker rooms, public change areas, and near public swimming pools. In terms of the foot infection, it is known as tinea pedis, whereas on the hands, it is referred to tinea manuum. 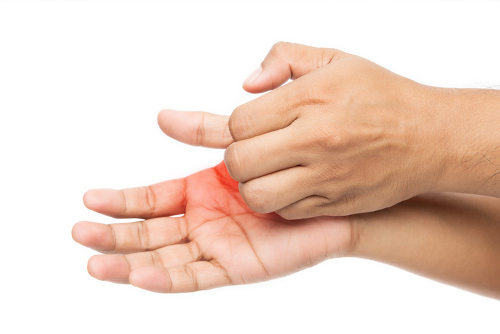 What Causes Athlete’s Foot on Hands? As it is acquired by the same fungus as ringworm, athlete’s foot can also be present on other parts of the body, including the hands. It is usually seen on the palms and between the fingers. People with existing skin conditions on their hands such as eczema have a higher risk of catching the disease. Let’s take a look at the causes to learn how to prevent it from happening. 1. Skin contact is the most common way to spread the infection. Whether you come in contact with an infected person or spread it from one area of your body to another, it can happen quite easily. Usually, it is transmitted by not washing hands after contact. 2. Animal or soil contact is another method of contracting tinea pedis or tinea manuum. It is common for owners of domestic pets, farmers, and hunters to come into contact and spread the infection. 3. Sharing personal belongings with an infected person can be easily avoided by not using others’ towels, linens, clothes, or hair brush. Another related skin condition concern is an allergic reaction to the fungus, known as a dermatophytid reaction. Although it is not fully understood, the athlete’s foot infection can cause a rash to develop on the body, separate from where the infection is located. The symptoms can mimic other skin conditions such as dermatitis and psoriasis and may not be diagnosed right away. If you suspect you may have athlete’s foot on the hands, check your nail bed to ensure the infection hasn’t spread, causing tinea unguium. This can feature dry, brittle nails that have become more thick, which can lead to more serious problems. There are several natural home remedies to treat tinea manuum. It is vital to remember to dry hands after any treatment. Try any of these as recommended by New Health Advisor. 1. Tea tree oil can be very useful for various ailments, including fighting infections. Soak your hands for 10 minutes in a bowl of water and 10 drops of the oil. Dry your hands afterwards. The antifungal oil can also be applied directly to the infected area. 2. Apple cider vinegar and salt combined create the perfect acidic mixture to fight a fungal infection. Add ½ cup of the vinegar and two tablespoons of salt to a bowl of warm water. Soak your infected hand or use to wipe with a cloth after your shower or bath. 3. Povidone-iodine, also known as PVPI, prevents fungal and bacterial progression. Twice a day, soak your hand for 20 minutes in a bowl of warm water and two capfuls of the PVPI. 4. Hydrogen peroxide is used for fighting bacteria and fungus infections. In one gallon of lukewarm water, add one pint of three percent hydrogen peroxide and soak hands for 20 to 30 minutes. The best time for this treatment is once in the morning and once in the evening. It will cause some pain and discomfort with any cracked skin. 5. Homemade cream is an easy topical treatment using common household ingredients. Mix 3 tablespoons of vinegar and ½ cup of baking soda together to create a paste substance. Three times a day, rub the paste onto the affected areas until rash disappears. The mixture can be kept in the refrigerator. 6. Over-the-counter medications should be used for two weeks after the rash disappears to prevent the return of the infection. Use directly onto the infected area and on an area of four to six centimeters around the rash. These medications are available in creams, sprays, powders and ointments. 7. Antifungal drugs may not be natural remedies but are the best choice when at-home treatments do not cure the infection. If you seek medical advice, your doctor may give you a liver-functioning blood test before prescribing any anti-fungal medication. Oral medication available includes fluconazole, terbinafine, and itraconazole. While contracting athlete’s foot on hands can happen very easily, there are a number of ways to prevent the fungal infection. Please note: These steps will not prevent the allergic trigger of a dermatophytid reaction. Monitor domestic animals for any rashes or hair loss, indicating a fungal infection. If you suspect such an infection, contact the vet and avoid constant contact until infection is treated completely. Wash hands thoroughly after any contact. It may seem like a strange and unusual topic, but athlete’s foot on hands is a common result of the fungal infection. Regular handwashing and avoiding contact with the affected area are part of preventing the spread to other parts of the body. It is just as important to avoid sharing personal belongings and contact with infected animals. Most of the time, the infection and its symptoms can be successfully treated with home remedies. If the infection spreads or does not appear to be healing, contact your doctor or dermatologist for more advanced treatment.